The five minute version of this lesson planning video is also available if you want a quick overview of how I lesson plan for a unit study or main lesson block. If you want the real time, full-of-distractions, lesson planning process, keep reading and check out the video tutorial below. Over the course of one week, I lesson planned this mini Botany Unit on Trees and Plants that’s only scheduled for two weeks! At this rate, I’ll be done with the unit before we finish lesson planning! In this lesson planning vlog, I walk you through the sometimes slow process of lesson planning for a unit study. This process is different than using a curriculum. When using a curriculum with everything lesson scheduled, you can plug in a lesson each day, collect your material and hopefully call it done. When doing a unit study, you need time to think about the lessons you’ll do and how long you plan to spend on the unit. You’ll want to collect your resources and projects and make sure you have the materials you need for your lessons. In this case, I am planning a lot of hands on projects and artistic lessons. We won’t have much writing nor a main lesson book. Instead, we’ll have lots of hands on projects, reading aloud and discussing the content we’ve read or the projects we’ve done. For that reason, I needed some time to figure it out. While some of the process is slow, the thinking things through part, once that’s decided, the rest falls into place rather quickly. Initially, I wasn’t sure what I wanted to cover during this unit. It could have gone in a number of different directions from studying various types of trees, forests, plants or biomes. I settled on a couple lessons on the rainforest with the remainder of the time focusing on the remaining lessons from our Botany Main Lesson block from the previous year. I’m happy with this approach because I really wished we could have finished the lessons we started last year. We completed nearly all of the main lesson block, but stopped short of some really good lessons. Now that we are dedicating a couple weeks to this unit (which includes more than those few remaining lessons), I feel we can give this unit justice. There are some lessons that may take a little thinking through like the form drawing or geometry lesson, but I think we can make it work, even if we take three weeks to do it. The Lesson Plans for this mini unit on Trees and Plants is available for you. I’ve approached the lesson plans for this unit differently from other lesson plans in that there are no days or dates assigned to the lessons and reading passages. There isn’t even a real order to the lesson either. This isn’t always possible as most of the time one lesson precedes another naturally and provides information that’s necessary before moving on. But in this case, there’s a lot of flexibility. I’ve included a lot of hands on projects and activities for this unit. Since we’ll observe the progress over a long period of time, we got started on those first before I was even done lesson planning. We spent a whole day out in the garden doing the majority of the garden work. We’ll spend the rest of the unit and most of the summer following up on those projects. 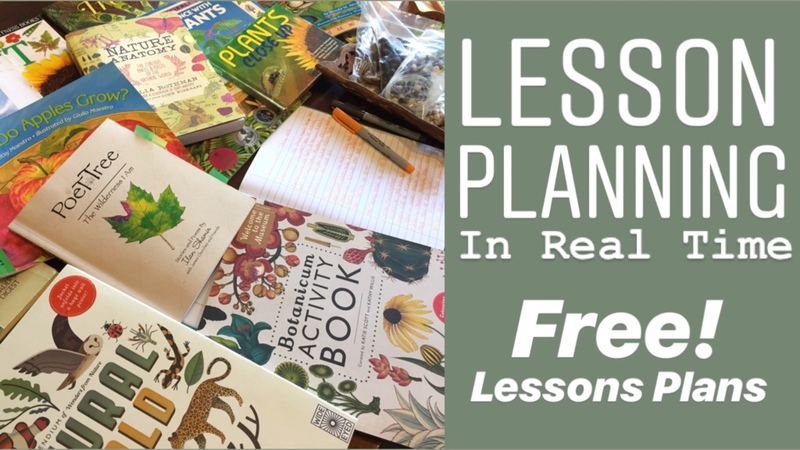 You can see what we’re up to on a daily basis by finding me on Instagram where you can see the day to day lessons for this unit and other lessons we’re doing in our homeschool. Hello and thank you for everything! I suspect I am not asking this in the “right” place but here I am. I live in Stuttgart Germany and although beginning reading at seven is completely developmentaly appropriate and my son will likely be fine with German we have been looking into teaching him to read English (he can speak English fluently) and I am having trouble finding age appropriate materials. For various reasons English reading is taught much earlier and it struck me listening to your recent q & a an English speaking Waldorfschule (or even better home school since we will do this at home) would know about materials to teach a seven year old to read. He is excited about learning letters and has even begun attaching sound to those symbols but I am concerned about beginning this journey with preprimers written for 3 & 4 year olds. Any suggestions? Hello Jill, sorry for the late response. I have just the curriculum for you! It’s called The Ordinary Parent’s Guide to Teaching Reading. I’ve used it with two children so far. It’s very non-Waldorf, but it’s easy to use and well paced. I also did a review of that curriculum on my YouTube channel and here on my website. They have all been to a woaldorf school up until we moved to the san bernardino area. I also use the live ed curriculums. I have a 10, 8, 6, 4, 1 and a preschooler. Hello Maria, welcome to homeschooling! San Bernardino is a bit far for us, and I don’t know much about the homeschooling community there. I hope it’s thriving!